Summary: A passionate old woman makes beautiful quilts which she gives away to those in need. She has a mysterious way with the animals of the wood where she sits and sews her creations. A selfish king demands one of her glorious creations. She refuses to give him a quilt unless he gives away all his possessions. Having never been denied, he does just that and travels throughout the land, giving away his many possessions while learning the joy of generosity. Hanna’s Comments: This book is part of a Dynamic Duo feature. 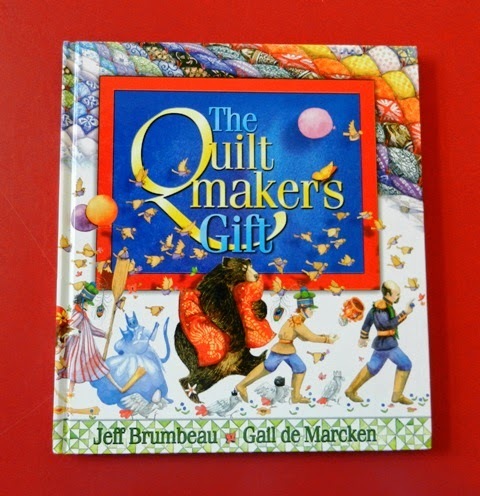 It's prequel, featured yesterday, is The Quiltmaker’s Journey which was published after the success of this book. There are lesson plans available on-line, and there are products about the quilt designs. As in the prequel, various block quilt patterns with names that relate to the story are featured in the illustrations. Idea(s) for Application: An adult retreat on using gifts and talents in service to others would be the perfect context to share this book. Children will also enjoy this story of courageous defiance to a king and his conversation to a life of generosity.